Daubeney Fields campaigners outside Hackney Town Hall in July. Photograph: Daubeney Fields Forever. A legal battle is looming over council plans to build affordable housing on a community garden in Clapton. 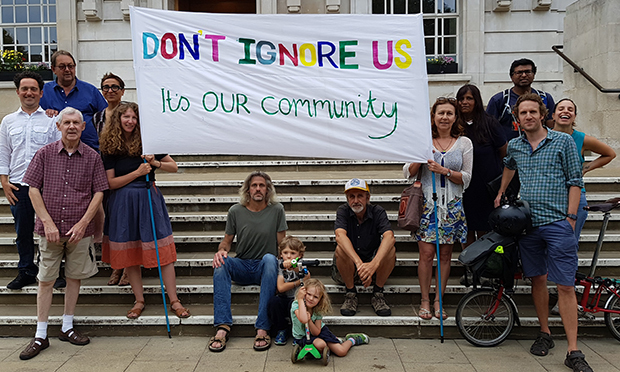 The Town Hall had approved plans to build on the council-owned Daubeney Road plot back in July, which had been loaned out on a temporary basis and transformed over years into a growing space described by campaigners as “a local oasis of calm”. 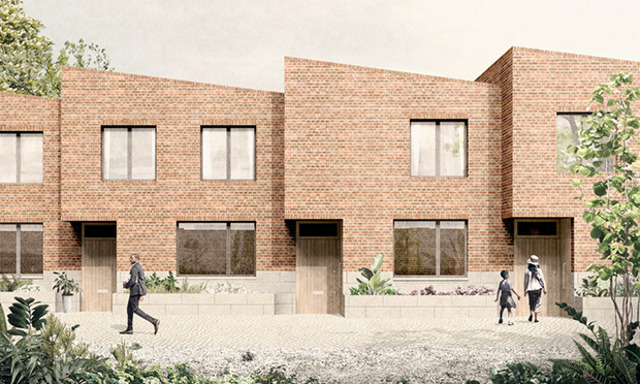 Campaign group Daubeney Fields Forever (DFF) has now stated that its crowdfunded legal team has challenged the council’s planning application to build the homes as deficient, and presented grounds for a potential judicial review. DFF chair Gerry Tissier said: “We hope Hackney Council heeds the lessons of this review and gives full consideration to nature in future planning applications. “It needs to work harder to avoid the loss of green spaces and save our natural environment from being buried under bricks and concrete. The campaigners claim the Town Hall should have added a commitment to a new garden as a formal condition in the planning application, and state that the preservation of a 1980s mural on the site as part of the application is not being done by the best possible means. However, the Town Hall has dismissed any legal challenge as without substance, pointing out that it has committed to providing space for the garden elsewhere and to retaining the mural. Artist’s impression of new Daubeney Road housing. Photograph: Hackney Council. It also has stated that applying a condition of the kind laid out by DFF’s solicitors would have been unlawful under planning rules. Campaigners had previously dismissed the Town Hall’s offer of a new garden on Redwald Road as unsuitable, stating that the quality of the old site and the new “simply do not compare”. The Town Hall had explored a previous proposal to turn existing garages on the site into affordable workspace, but found the approach to be unviable. Construction on Daubeney Road is set for completion in 2020, with 11 homes planned under a mixture of social rent and shared ownership. Hackney Mayor Philip Glanville said: “With 13,000 families waiting for a council home, Hackney is building genuinely affordable council housing, and we spent months working with local people on designs for these desperately needed 11 new homes for social rent and shared ownership. “Where we develop new homes, we will always seek to also improve local facilities. “I was instrumental in granting permission for the current garden as a temporary measure four years ago, but it was always designed to be a temporary location. That’s why we’ve committed to creating a new community garden as part of the project, as well as retaining the existing mural.